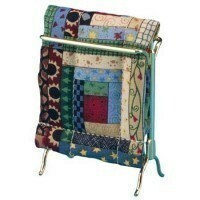 Our Dollhouse Quilt Rack is a scale miniature. & is perfect for your miniature bedroom scene. Note: The quilt is attached - Fabrics may vary.